I’m a church planter from Harrisonburg, VA (home of the JMU Dukes). My wife and I met in college. We moved back to VA to plant a church. Several years ago, we transitioned the church to a network of house churches. Several months ago, we moved to Greenville, NC (home of the East Carolina University Pirates) to be closer to my wife’s family. The moment we knew God was leading to move to NC, I knew I would no longer be a “professional minister.” So I transitioned the leadership at our church, we packed up the U-Haul, and moved. I’m now a hospice chaplain, and we’re laying the groundwork for our first house church in Greenville. Along with being a husband, I’m the father of three beautiful girls; 7, 3, and the last of which will arrive around Halloween. My new book “The Jumbo Shrimp Gospel” was inspired by a conversation I had with my 7 year old. I read her the part of Jesus’ sermon on the plain in Luke 6 where Jesus talked about turning the other cheek and getting naked when someone takes your shirt (yeah, that’s what he said). After I explained it to her, she said, “Dad, that’s stupid!” My kid just called Jesus stupid. The life of an agent of the kingdom of God goes against the grain of everything we hold dear. We desire safety, security, and comfort. The gospel of the kingdom of God calls us to risk, danger, and suffering. Like the phrase “jumbo shrimp”, the gospel is oxymoronic. It doesn’t make sense, but it’s divinely brilliant. 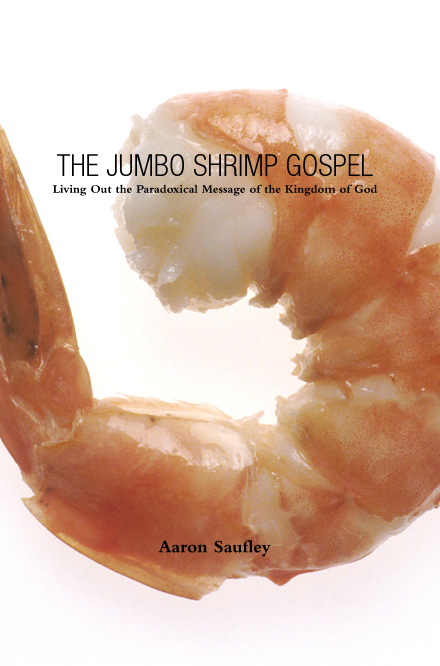 “The Jumbo Shrimp Gospel” explores the oxymoronic nature of the gospel of the kingdom of God, as well as how we’re to live it out. From the losers God used to accomplish his purposes, to Jesus’ incarnation; from the nobodies Jesus called to follow Him, to how His death and resurrection secured salvation for mankind (and that’s just for starters). “The Jumbo Shrimp Gospel” challenges our assumptions about church, as well as what it means to live on mission with Jesus. So grab a side of cocktail sauce and get a heapin’ helpin’ of Jumbo Shrimp. You can read more from Aaron on his blog, The Road Less Traveled. You can also order a copy of Jumbo Shrimp Gospel by clicking on the link on the left sidebar of this blog.